It’s billed as the largest show in its industry. The GIE+EXPO 2013 was a three-day extravaganza on October 23 to 25 at the Kentucky Expo Center – 500,000 square feet of the latest and greatest in outdoor power equipment, lawn and garden products and light construction and landscape equipment. TapSnap was there with Chicagoland franchisee Barry MacDonald, drawing attention to the Ariens Company and Gravely trade show booth. A family business that goes back five generations, Ariens is an innovative maker of industrial equipment – everything from residential and commercial mowers to snow throwers and much more. “TapSnap acted as a lure, inspiring people to come into the Ariens trade show area and pose for pictures at the wheel of some of their best equipment,” says Barry. 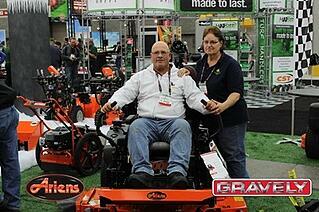 This was Barry’s second event with Ariens, which is based in Brillion, Wis. The first was a party celebrating the company’s 80th anniversary, and employees whose families had been with the company for three, four and even five generations. That event was attended by 1,200 people and took place at the Delta Center in Milwaukee. Ariens employee Carol Dilger says, "Tapsnap was so much fun and was received so well by our dealers at our Celebration Dinner in September, we just had to have it at the GIE Expo...we are looking forward to all of the guests getting their picture taken and we will be posting all the branded pictures to our Facebook page to promote our social media exposure."